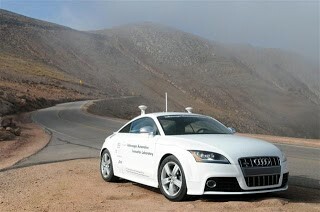 In 2010, Professor Chris Gerdes of Stanford along with some of his students set up an Audi TTS (nicknamed "Shelley") to be capable of completing a 12.5-mile race course at top speeds in order determine new methods of teaching drivers to more safely control their vehicles at sharp turns and/or at higher speeds. The experimenters noted that race car drivers are capable of maintaining control of their vehicles in conditions that would cause most, if not all normal drivers to lose control. The system integrated into Shelley was intended to assist in both determining how to help drivers acquire the skills to maintain greater control over their vehicles, and also to find ways to provide better automated control management in consumer vehicles. Through numerous sensors, Shelley was able to detect a corner and estimate its required entry speed and angle to achieve an ideal balance between friction and speed – allowing turns to be completed at the highest possible speed without spinning out. The results of the test showed that the system was indeed capable of reaching this ideal balance. Vehicle automation has been a well publicized concept over the last few years and the implications (both positive and negative) are huge. For instance, with widespread adoption of automated vehicles and Vehicle to Vehicle (V2V) communication, the number of accidents due to drunk-driving, carelessness and poor line-of-sight would be reduced. Global fuel consumption would decrease due to less speed violations and excessive acceleration by poor drivers and traffic would be more effectively managed with vehicles coordinating themselves to automatically take the best routes, avoiding buildups on specific roadways. These kinds of changes would revolutionize vehicular safety – so long as the vehicles themselves can be calibrated to drive 100% safely. Today in 2012, Shelley is still in use, creating data which may help the next generation of semi and fully-automated vehicles to provide greater efficiency and safety to their operators and passengers. With autonomous vehicles already on the horizon (Google received the first ever Automated Vehicle License: “AU-001” in Nevada earlier this year), it looks as though we are very close to seeing this new generation of vehicles released, perhaps (hopefully) making our roads a little bit safer.